The dispute over Kashmir has been rumbling on since Partition in 1947. India and Pakistan are mostly left to get on with their conflict with little intervention from the outside world. This week however, it appeared that the conflict may escalate after India targeted terrorist activity within Pakistan and had one of their aircraft shot down in the process. The pilot was held for a few days, but was allowed to return to India in a gesture of peace. This is all very interesting, I’m sure you will agree, but it meant that my flight had to go the long way round and cut deep into my bird-watching time. As a result, I was unable to get as far afield as I would have liked and ended up at the flood defence barrages on Najafgarh Drain. Gestures of generosity abounded today and I was invited to explore the island that split the drain lengthways. Normally, it would not be possible to walk here, but people were drawing a collective sigh of relief as two nuclear powers stood down and petty rules were more pliant than usual. 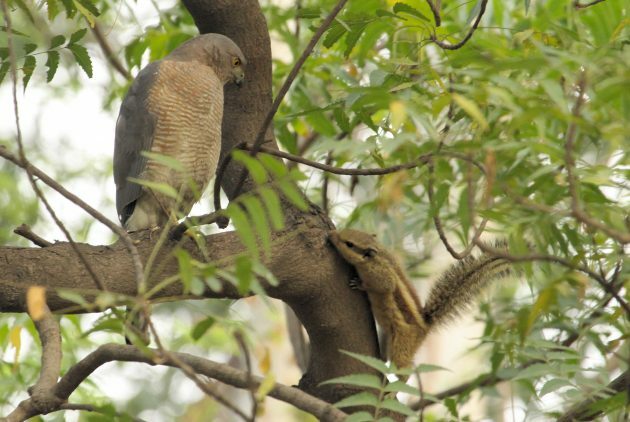 A Palm Squirrel and a Shikra agreed to a halt in hostilities for the day. 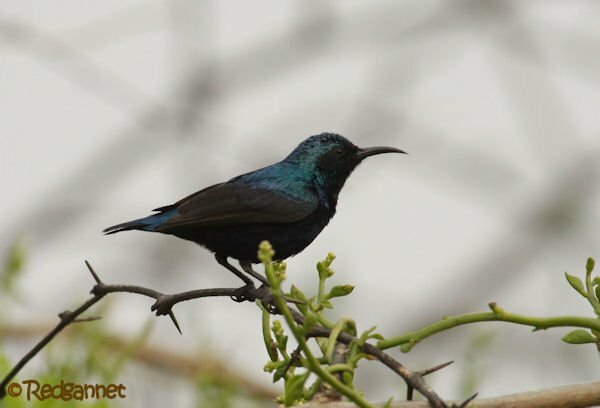 The Purple Sunbird is an elegant example of it’s family. Dressed darkly, it is commonly silhouetted against the sky as it calls from a high perch. 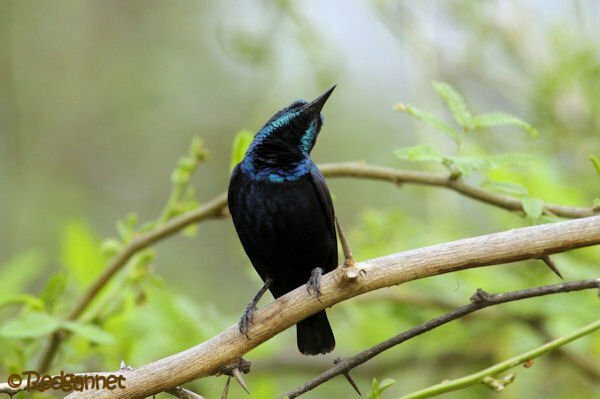 Sunbirds are the Old World’s version of the hummingbird. Physical appearance, habits and feeding styles are similar, but they are distant cousins, coincidentally making use of the same niches in different hemispheres. 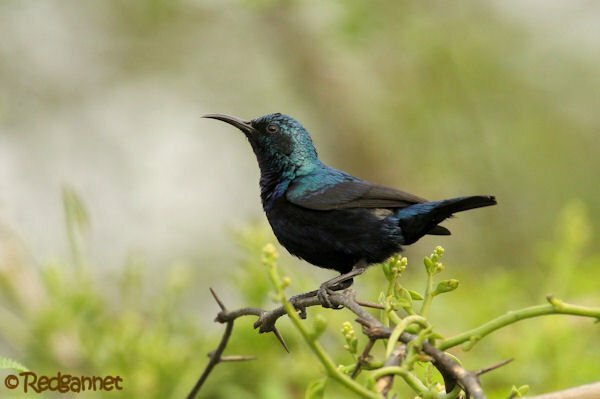 Today was a day of generosity and for once the purple sunbird came down from his lofty lookout and displayed in the lower branches. With some darker bokeh behind him, it was possible to enjoy the subtle variations in colour on this beautiful bird. 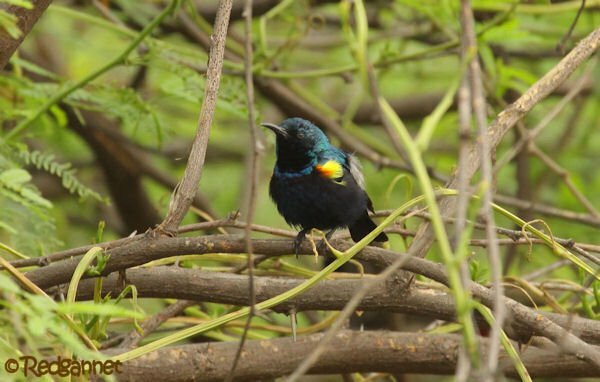 The yellow and orange tufts were very obvious when he flashed them in display. 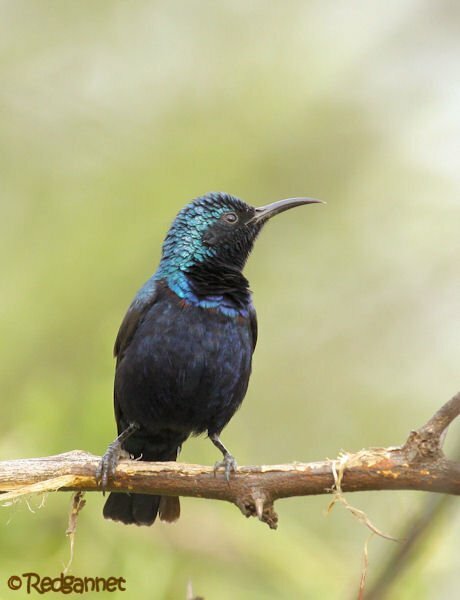 His irridescent head feathers catch the light in the same way as a hummingbird’s and a slight change of angle alters the apparent colour from blue to black. 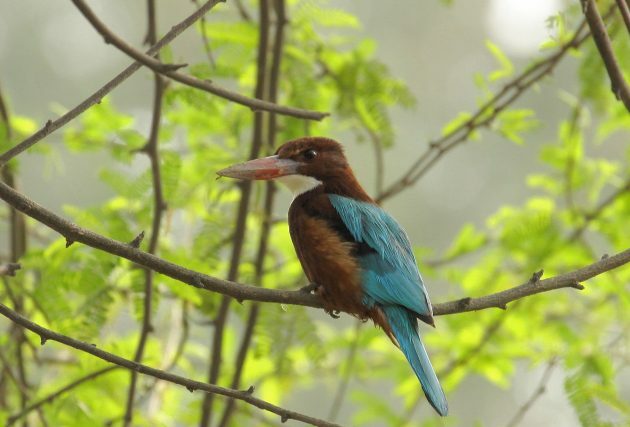 There are at least three hues of blue and purple on the head and throat and this was the first time that I had seen the mauve colouration below the gorgette.